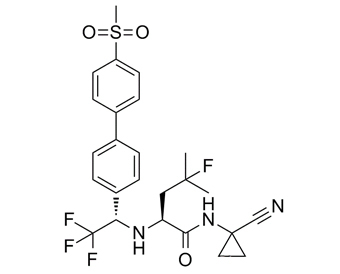 Odanacatib, also known as MK-0822, is an inhibitor of cathepsin K with potential anti-osteoporotic activity. Odanacatib selectively binds to and inhibits the activity of cathepsin K, which may result in a reduction in bone resorption, improvement of bone mineral density, and a reversal in osteoporotic changes. Cathepsin K, a tissue-specific cysteine protease that catalyzes degradation of bone matrix proteins such as collagen I/II, elastin, and osteonectin plays an important role in osteoclast function and bone resorption. Check for active clinical trials or closed clinical trials using this agent. (NCI Thesaurus).
. Jacques Yves Gauthier, et al. The discovery of odanacatib (MK-0822), a selective inhibitor of cathepsin K. Bioorg Med Chem Lett. 2008 Feb 1;18(3):923-8.
. Leung P, et al. The effects of the cathepsin K inhibitor odanacatib on osteoclastic bone resorption and vesicular trafficking. Bone. 2011 Oct;49(4):623-635.